Coupon codes are a very common marketing technique which brings customers back to your store. They can also attract new visitors by giving them a gift in the form of a discount from their purchase. The easiest way to start using coupon codes is to add a new item in IncoPOS from Edit->Items… New. Enter the name of the discount. Enter a code or a barcode for this discount so you can scan and use this discount quickly. It is better to use barcodes if possible as this will make its use much faster. Select the price of the discount or the value that you are going to reduce from the price. In the Special section enable the option “Discount” and save the item. Now when you scan that item the price it has will be subtracted from the total. If you want you can make that coupon code available only when a certain item is purchased. This helps for situations like a coupon code for $5 when purchasing shoes. In this case you can achieve that using a price rule. From Edit->Administration->Price rules... Select New. Then enter a name for the price rule for example “Shoes discount $5”. 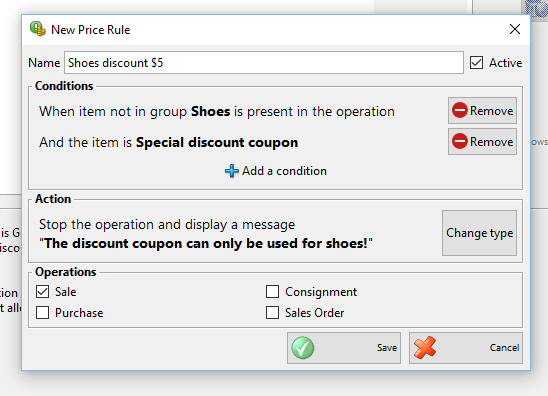 This rule will stop the operation from being saved with a warning when the coupon is used and there are no items from the “Shoes” group. 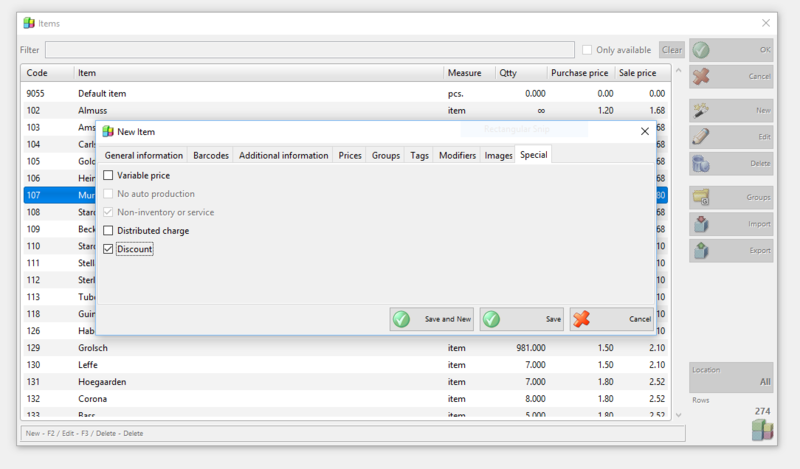 To do that add conditions to the price rule to match items in the operation that are not in a specific group. 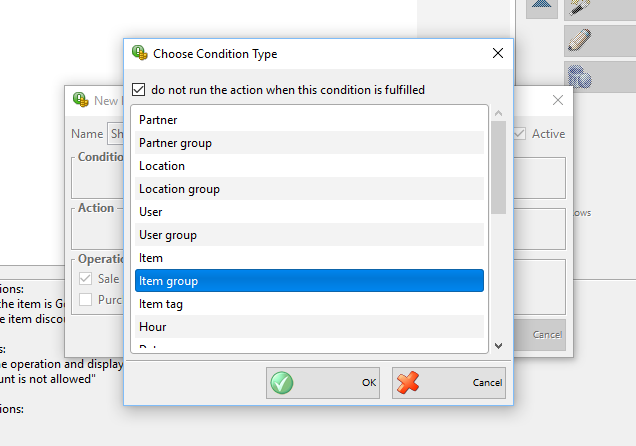 Use the checkbox on the top of the condition type selection. Then select the items group “Shoes” and press OK. Add another condition to match item used in the operation and select the new discount item. Add an action of type “Stop the operation” and select a message to be displayed to the cashier when the price rule is activated. Save the price rule and test it. Create a new sale operation from the Operation->Sale, Point of Sale or Touch screen. Add an item to sell which is in the “Shoes” group and add the discount item. When pressing Finish the sale should be completed without any warnings. Do the same but this time add only items which are not in the “Shoes” group and also add the discount item. When you try to finish the sale you will see a message saying that the discount cannot be used.